I think I've mentioned before that I work in a multi-storey building (often voted the ugliest building in Sydney) located on one of the busiest and most polluted intersections in the city. 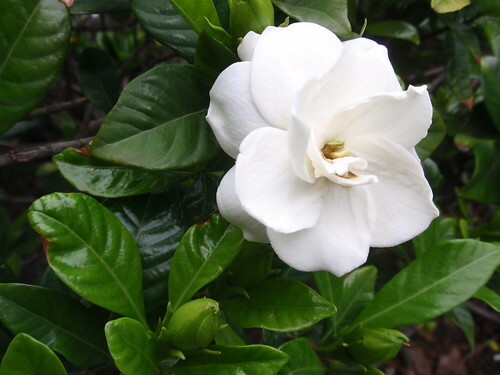 But at this time of the year when you come out the front entrance to the congested and grubby streetfront you are assailed by the wonderfully romantic scent of gardenias. Some years ago masses of gardenias were planted in large containers around the otherwise barren front courtyard. However incongruous the context, I love how evocative this perfume is of lazy summer evenings. Life seems full of possibilities. A few minutes of pleasure. I bought some things from Donna's etsy shop. 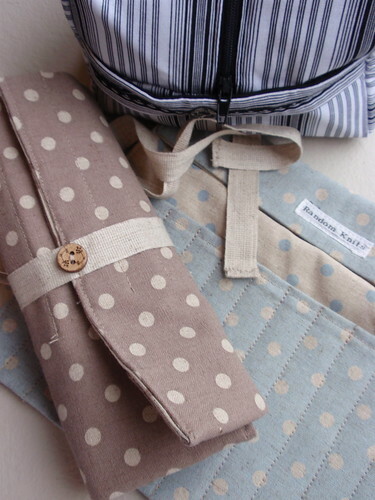 A couple of fabric rolls for storing dpns (double-pointed knitting needles) and a small project bag that's perfect for sock knitting. The finish of these items gives me such pleasure. The beige linen ties for the needle rolls are just right. The tiny buttons that trim both the rolls and the project bag are perfectly chosen. And the fit of the zipper in the project bag is a joy to behold. I suspect I'm a finishing nerd. Now all I need to do is to round up my dpns and file them in the needle rolls. I wish tidying up gave me the same amount of pleasure I get from contemplating Donna's sewing. 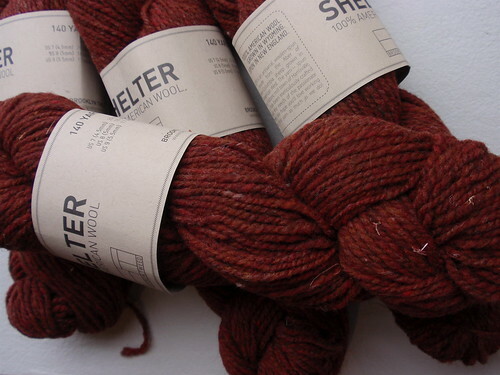 I ordered some of Brooklyn Tweed's 'Shelter' yarn from Knit Purl (my not-so-secret place of temptation) and it arrived last week. I'm not sure why I bought the yarn. It was being discussed on internet sites? My admiration for Jared Flood's knitting aesthetic? Sheer self-indulgence? Probably a combination of all these motives. The yarn does give me great pleasure. It's robust and rustic and the colours are subtly rich. It's very much in the shetland tradition of hard-wearing, slightly catchy yarns and reminds me of some Jamieson yarn I bought very cheaply some time ago and haven't yet knitted up. But it is expensive, and with sensible shopping around some of the UK sites in particular, there'd be very acceptable alternatives. I admire what Jared Flood is doing in creating yarn that suits his style and meets his standards for quality and 'localism' of both the raw materials and the mechanics of producing the yarn. However, the attraction of 'localism' rapidly disappears once you have to transport the yarn all the way to Australia. I think this yarn, lovely as it is, will be a one-off or only very infrequently repeated pleasure. 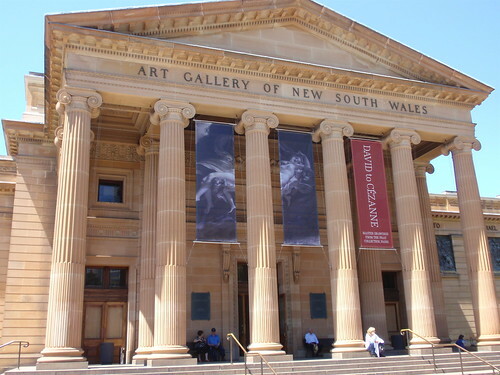 Over the weekend I visited the Art Gallery of NSW. This is not one of the world's great art collections - in fact it's not even the best Australian collection - but the AGNSW gives me great pleasure. Partly it's the location with its view over Wolloomooloo bay to Sydney Harbour, but mostly it's the program of free events that are always on offer. There's always a film program with films loosely linked to one of the major exhibitions on show. Currently it's a program of films set in France during the high Romantic period covered by the exhibition of drawings From David to Cezanne. We saw the classic French film 'Les enfants du paradis' - made in France under all kinds of constraints under German occupation during the second world war. The film is romantic and sad and cynical and pragmatic and very very long. It provided an afternoon of emotional indulgence. We also saw the current exhibition of Aboriginal artworks, Art and Soul. Many of these works were included in the recent, wonderful documentary on Aboriginal art by the same name. The exhibition is luminously beautiful and the documentary well worth viewing. My daughter was awarded a highly competitive research grant which will fund her employment and research for the next three years. Not a small, but a great pleasure. A significant increase in the value of the Australian dollar against the US dollar coincided with the publication of the commemorative edition of Elizabeth Zimmermann's Knitter's Almanac. What else could I do? Of course I purchased a copy. I've had a paperback copy of this book for several years, but I'm a bit of a sucker for well-produced hardback editions of books. This one commemorates 100 years since Elizabeth Zimmermann's birth. It's a fine book with a very pleasingly textured red binding with gold embossed Elizabeth Zimmermann signature and signs of the zodiac beneath the wrapper; good quality pages and end-papers; a new preface by EZ's daughter and collaborator Meg Swansen and an introduction by Stephanie Pearl-McPhee; coloured photos of the garments in modern colours and yarns (my favourite is the 'nether garments' in riotous colour-work), and the welcome addition of Pamela Wynne's pattern for the February Lady Sweater. I'm also a bit of a sucker for plans and programs and promises of schemes that will miraculously bring order to my life. An almanac with knitting projects for the year enables fantasies of order, productivity, and quiet industry. 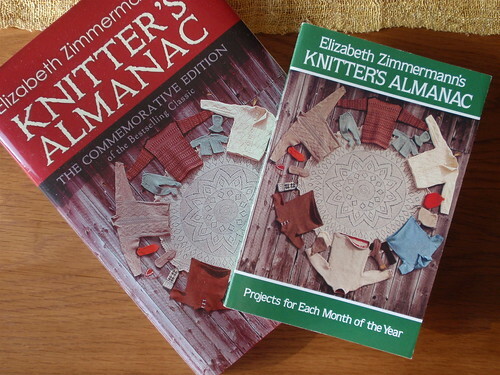 I can remember when I bought the paperback version I was very tempted by the idea of knitting my way through the months according to Elizabeth Zimmermann's plan. Purchasing the hardback version revived these fantasies...for a moment. 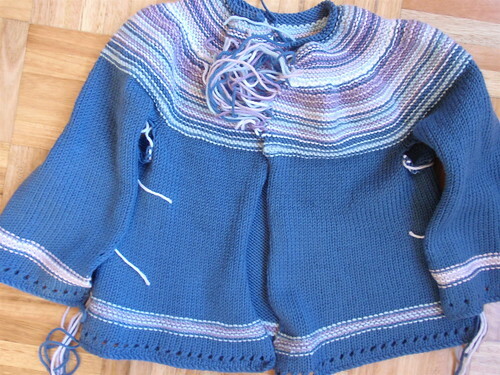 Because the truth is that, much as I admire Elizabeth Zimmermann's approach to knitting, her creativity, and her love of garter stitch, many of her garments are unsuited to the Sydney climate and they are just not things I can imagine wearing. And a whole year of knitting according to her almanac would mean I'd have time for nothing else in my life. 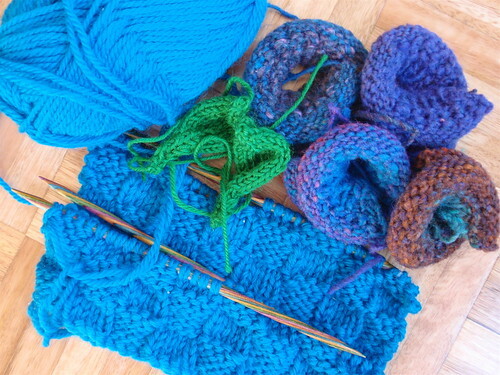 Nevertheless, her friendly, engaging writing style, and her ability to make knitting sound like a matter of common sense rather than skill and experience is tempting. I feel as if I've written this post many times before. 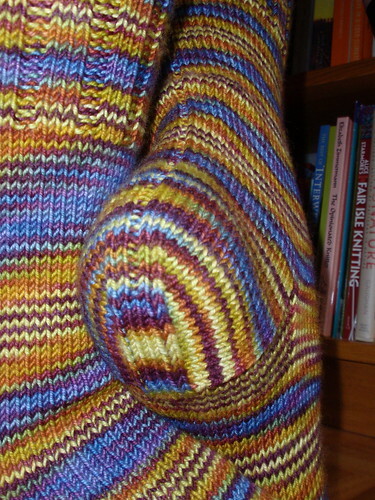 It's the post about the distracted knitter. Any readers who knit know this story well. It's the one about the constant distraction of new and exciting knitting projects - even when you are surrounded by pieces of unfinished knitting that were equally exciting and glittery in their early stages. Much as I like this pattern, avoiding this task is understandable - I have to finish the picot hems and darn in all those stripey ends before I can begin the front bands. And anyway, this winter has passed and the urgency for finishing has disappeared. 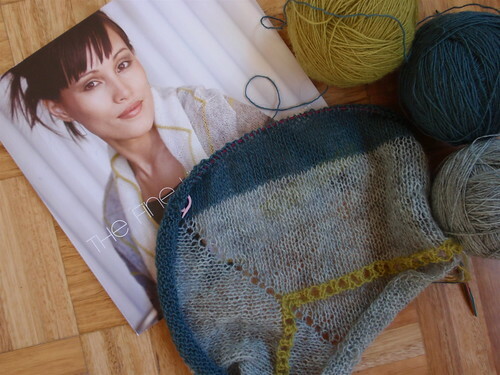 I'm hoping nothing new and glitzy will distract me from finishing this project - though the endless lengths of i-cord that finish the shawl might slow me down a bit. Most of this morning was spent hanging paintings and other decorative things on my walls. It's almost exactly two months since I moved into my new apartment, and this task has been hanging over me all this time. 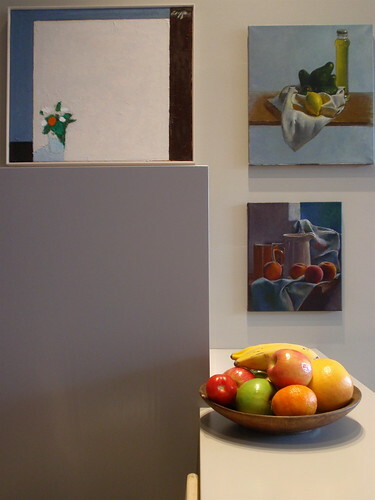 I haven't really felt settled, or able to invite people around, as paintings and other works were propped precariously against walls or still stored in a carton in the living room as I decided what I wanted to do with them. With nothing hanging on them, the walls of the apartment looked so pristine and the lines of the paint finishes beautifully neat and angular. There was such great attraction in the minimalist aesthetic of bare walls that I seriously considered leaving them that way. But my paintings and wall hangings of various kinds have been gathered over years and remind me of people and places. Most of the paintings, etchings and works on paper I have were done by artist friends or people I've known well - discarding them would have seemed like discarding part of those relationships. As for most things with this move, when in doubt I consulted Heather. We spent a very pleasurable few hours a couple of weeks ago trying out all sorts of combinations and deciding what could go where. Then this morning the picture hanger came to do his thing. It seemed like a great indulgence, but the pictures have been hung just where I wanted them, the damage to the walls is minimal, and the picture hanger had a ladder that enabled him to do the high hanging safely. I winced as the drill punctured the wall for the first hanging and doubted (yet again) whether I was doing the right thing in reintroducing so much potential clutter to my space. 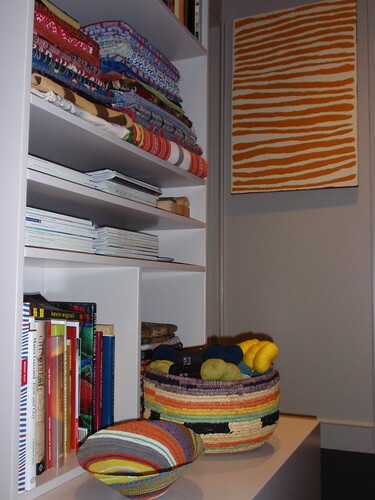 But the instant the hanging was done - seventeen things in all in my small space - I felt so much more at home. I am much more comfortable surrounded again by the patterns and images that have been part of my life for so long. An added benefit is that many of them have been reinvigorated by their new neighbours or new locations or the background of different colours, and I'm seeing them afresh. Reluctantly, I have to admit that a neat, minimalist aesthetic is just not me. OK. I've decided what I'm going to knit for my next pair of Personal Sock Club socks, using the irresistible deep blue Wollmeise 80/20. 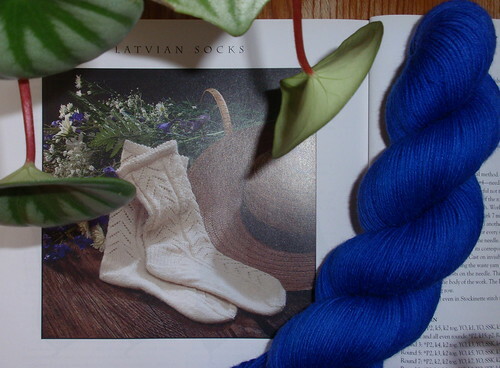 Nancy Bush's 'Latvian Socks' from her 1994 publication Folk Socks. * best of all - they're Nancy Bush. I just know they will work if I follow the pattern. Infallible. Due date? 19 November. Let's see how I go. 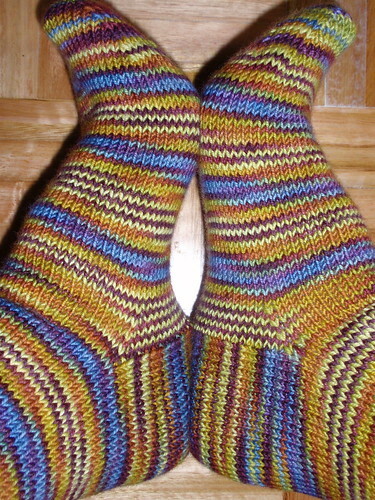 With thanks to Jody who supplied the scrap of yarn I needed to complete them when I ran out a few rows short of finishing the toe, my fourth pair of 2010 Personal Sock Club socks have been finished ahead of their 8 October deadline. One of the few times in my life I've not been scrambling at the last minute to meet a deadline. 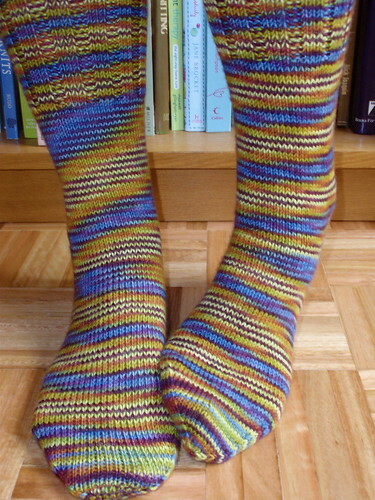 I really like the combination of a very classic Nancy Bush design from Knitting Vintage Socks (Gentleman's Plain Winter Sock with Dutch Heel) with a wildly colourful yarn (Socks That Rock yarn in the delightfully named Tide Pooling). The otherwise plain socks have a deep cuff of k3 x p2 ribbing and the eponymous Dutch heel. While the fabric of the socks is very neat, I think they might have been better if I'd knitted them on 2.25m needles rather than the 2.5 I used. They are very comfortable, but I usually like my socks to fit a little more snugly. Nevertheless, the colours are so quirkily wonderful that I know I'll love to wear them. I've just opened my next manilla envelope to reveal my fifth PSC project yarn - it's Wollmeise 80 / 20 in a deep bright blue named Hortensie. 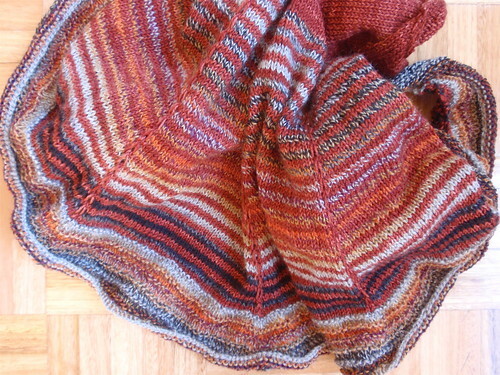 Now I just need to find a pattern that does justice to this special yarn.